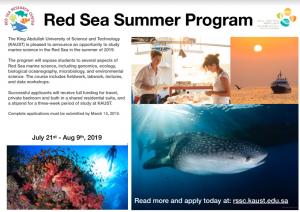 KAUST’s Marine Science program will be hosting a three-week summer course from July 21 to August 8, 2019. The course will highlight a range of topics relevant to the Red Sea Research Center’s work, including genomics, microbiology, ecology, environmental science, and biological oceanography. Several KAUST faculty will be participating. The course will consist of a combination of lectures, fieldwork, labwork, and data analysis workshops, with an emphasis on hands-on experiences. The course is open to undergraduate or Master’s students, or people who have recently graduated from these degrees. To view the NAFA [SCHLRSHP] listserv archives or to unsubscribe from the listserv, click on (or type) http://listserv.uark.edu/archives/schlrshp.html. Interested in Taking a Summer Anatomy Dissection Course? The department of Pathology and Anatomical Sciences in the Jacobs School of Medicine and Biomedical Sciences is currently accepting undergraduate students to enroll in their Gross Human Anatomy course with cadaver dissection during the summer from May 21st – July 13th. The course is 6 credits hours and does have an additional fee associated with it. This is a wonderful opportunity for students to participate in hands-on full body dissection and to hear clinically based lectures. If interested, please contact Kelli at khickey@buffalo.edu to make sure students have the necessary prerequisites and for any additional questions. It is suggested that students have some level of anatomy and physiology completed before you take the course, however they will make exceptions based on what a student has taken. Once it is determined that prerequisites have been met, the department will enroll you in the class. Title VIII fellowships fund graduate students, area studies specialists and others with a Bachelor’s degree for study of Bosnian/Croatian/Serbian, Estonian, Georgian, Hungarian, Latvian, Lithuanian, Russian (at the 3rd year or higher), and Ukrainian in the Summer Language Workshop. Title VIII Portable fellowships fund graduate students, area studies specialists and others with a Bachelor’s degree for study abroad of Azerbaijani, BCS, Czech, Estonian, Georgian, Hungarian, Kazakh, Kyrgyz, Latvian, Lithuanian, Polish, Romanian, Russian, Tajik, Tatar, Turkmen, Ukrainian, Uyghur, and Uzbek at levels higher than those offered in the Summer Language Workshop’s 2018 domestic program. IU Project GO Scholarships fully funds Army, Air Force, Navy, and Marine Option ROTC students for domestic study of Arabic, Chinese, Persian, Russian, and Turkish in the Summer Language Workshop. The deadline for application is February 20, 2018. Find out more and apply at the Project GO website. The Department of Education Title VI Foreign Language and Area Studies (FLAS) fellowshipsFLAS fellowships provide a $2,500 summer stipend plus tuition award (up to $5,000 FLAS tuition limit) for the cost of Summer Language Workshop courses. The Association for the Advancement of Baltic Studies provides scholarships of up to $2,500 for the study of Baltic languages in the IU Summer Language Workshop. All Workshop participants are eligible to apply. See the AABS Scholarship page for details. Apply for AABS funding by February 2, 2018 for priority consideration. The Russian and East European Institute Summer Russian Scholarship funds first-generation undergraduate students for the study of Russian at the second year and above. The scholarship will provide at least $2500 to be used for tuition, fees, or living expenses. For eligibility requirements and to apply, visit the REEI website. Questions may be addressed to Mark Trotter, Assistant Director REEI (812-856-5247). The Russian Studies Workshop at Indiana University Summer Russian Study Fellowshipprovides $6500 to cover tuition/mandatory fees (approximately $3000), and living costs to eligible students who enroll in a 6-credit graduate Russian course in the IU Summer Language Workshop during the Summer 2018 session. Funding for the RSW is provided by the Carnegie Corporation of New York and administered through the IU Russian and Eastern European Institute. Funded through generous donations of alumni and supporters of the Indiana University Summer Language Workshop, the “Friends” scholarship funds participants in any Workshop course. The scholarships are open to any participant who is not eligible for another Workshop scholarship or fellowship. Review eligibility requirements and apply via the online application. Kurdish (Sorani) – 1st and 2nd year – will be taught at Indiana University, Bloomington, Summer Language Workshop (SWSEEL 2017). Please announce this to your students and colleagues who might be interested. The KNU 3-week Global Summer School brings together students and academics from all over the world for a unique intercultural learning experience and special taste of Korean culture. All courses are taught in English, and you will take courses with Korean students as well as other participants from all over the world. All classes are scheduled in the morning, and all cultural activities are scheduled in the afternoon. All participants will be assigned a double-occupancy room in the KNU on-campus dormitories (2 students per room). Rooms are furnished with beds, mattresses, cabinets, desks, chairs, and bookshelves. Breakfast is provided at the dormitory cafeteria. Your personal guide to KNU and Korean culture: your buddy will contact you via e-mail prior to your departure for Korea. 1)KNU partner universities (International Offices) are asked to nominate their students via e-mail to mj3jm@knu.ac.kr by April 25, 2017. 2)All applicants are required to complete an on-line application at the KNU web site (click here) by May 1, 2017. KNU will issue a Letter of Acceptance and Invoice, which will be e-mailed to each applicant. * Registration fee is non-refundable. The Division of University Life & Services is excited to announce that the 2017 Student Leadership International Dialogue and Exchange (SLIDE) Program will take UB student leaders to Scotland and Ireland from May 23 – June 3, 2017. SLIDE is an international learning experience specifically designed for UB student leaders, giving them an opportunity to learn about leadership from a global perspective and interact firsthand with other student leaders from around the world. For more detailed information, including program logistics and costs, please download the informational slideshow. Online applications are due via UBlinked by Wednesday, November 30, 2016. If selected to move forward in the application process, you will be notified to schedule a 30-minute informal interview. Spend Your Summer at Mount Vernon! This is a six-week program includes housing at George Washington’s estate, transportation, meals, and a $500 weekly stipend. Students are paired with a mentor to learn how to turn a personal passion into a blueprint for action. Students will network with successful Washington, DC professionals and participate in unique experiences in our nation’s capital. The Deadline for applications is January 11, 2017. Experience cutting edge research in a Biomedical Science Lab! Opportunity includes stipend and free housing. Examining the components of managing a successful job/internship search by focusing on goal setting, identifying transferable skills, professional branding and integration of effective search skills. Self-assessment instruments, planning and research skills will be cultivated to help generate career paths and facilitate your transition into the world of work. the lives of human beings (e.g. families, economies, political systems, religions), as well as the categories of expression (e.g. language, symbolism, medicine, ecology), and processes of contemporary cultural change around the world. Humans have always sought to understand where we came from, why we are the way we are, and where we fit amongst the animal kingdom. Physical anthropology—the study of human evolution and origins—attempts to answer these questions, looking at our past and contemporary non-human primates for clues. This course will trace our human origins, from the earliest possible fossil hominins, looking at variations and adaptations that ultimately led to modern humans. We will discuss evolutionary theory and genetics, the fossil record, contemporary non-human primates, and human adaptations, applying these ideas to help us understand our place in the world. Archaeology is a field of study focused on understanding the human past from the material remains preserved and uncovered in modern times. In this course, we will explore the world and human diversity throughout time, find out how archaeologists interpret the past using artifacts, sites, and human remains, discover the greatest archaeological finds of all time, and learn to decipher fact from fiction in popular portrayals of past societies. This introduction to the field of archaeology will bring to life the fascinating study of ancient cultures, in a short but dynamic six-week summer course. Anthropology Majors: Fulfill Your Intro Course Requirements This Summer! Non-Anthropology Majors: Consider These Classes For Your General Education Social Science Requirement!